It's surpassingly rich, absurdly cheesy, deeply satisfying and somehow just better than other macaroni and cheese has ever come close to being — here's the recipe from Seattle’s most acclaimed chef (plus an important tip on cooking!). 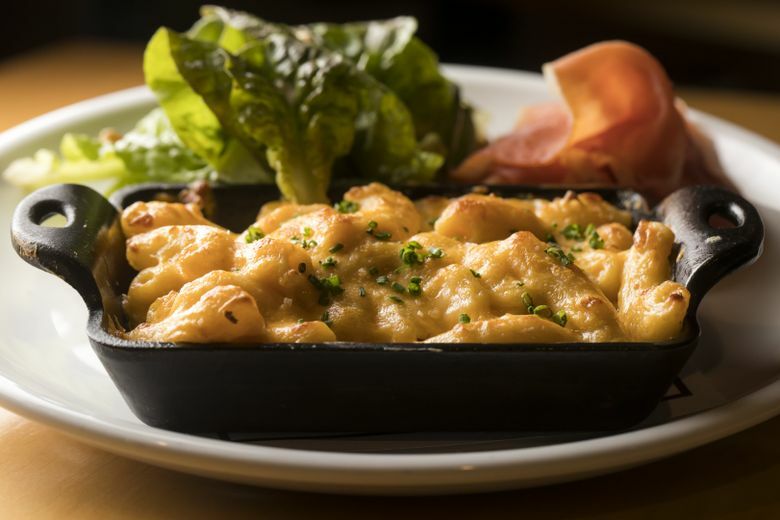 Once you have the recipe, you can make this mac ’n’ cheese whenever you want — Jordan serves it Thursdays only, and only at his very-difficult-to-get-into JuneBaby. And when you can have this macaroni and cheese whenever you want, you can die happy, friend. After the sauce is mixed with the macaroni — when it comes to cooking the whole shebang — do as Edouardo does, not as Edouardo says. His recipe recommends putting it all in a medium casserole dish, topping it with (yes!) more cheese, then broiling it until the more-cheese is melted. At JuneBaby, as previously mentioned, the mac ’n’ cheese comes in a small cast-iron pan, spread into a thinner layer, which gives additional surface area for broiled-cheese goodness — and, crucially, it’s not broiled just until the cheese is melted, but until it’s almost-burned-blistery-great. With apologies to the macaroni master, I’ve made a notation in the recipe about this important aspect. In closing, be careful — at some point, you might encounter something hotter than a cast-iron pan that’s been very recently under a broiler, but hopefully you won’t be this close to it. And getting the macaroni to your mouth ASAP might make you forget: hot! Bettina Hansen is a Times staff photographer.